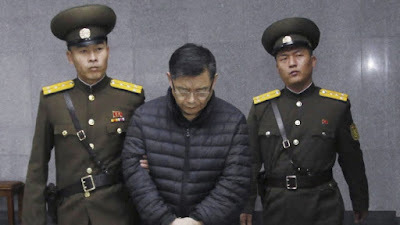 A Supreme Court in North Korea has sentenced Hyeon Soo Lim, who pastors the Light Korean Presbyterian Church in Toronto to life imprisonment with hard labour after he was convicted of committing 'crimes against the state'. Pastor Soo Lim who had been in detention since February was given the sentence after a brief trial. He had earlier appeared at a news conference organized by North Korean authorities in Pyongyang in July and admitted to plotting to overthrow the North Korean state. But other foreigners detained in North Korea and then released have said they were coerced into making similar statements and confessing guilt during their detention. Both the U.S. and Canadian governments have warn it's citizens against travelling to North Korea as the state has very strict rules against any missionary or religious activities that it sees as threatening the supremacy of its ruling regime.